Now that Samoline's Giraffe woobie is done, I need another project to have that requires little attention that I can bring with me to crochet club and other times we travel. I need something that I can work on without my computer and that is easy to knit while chatting. 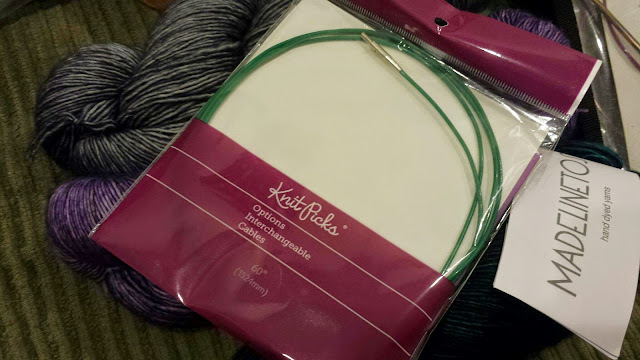 For this project I'm using Matelinetosh Merino Light in Nebula (teal), Heuchera (purple) and Charcoal (grey). 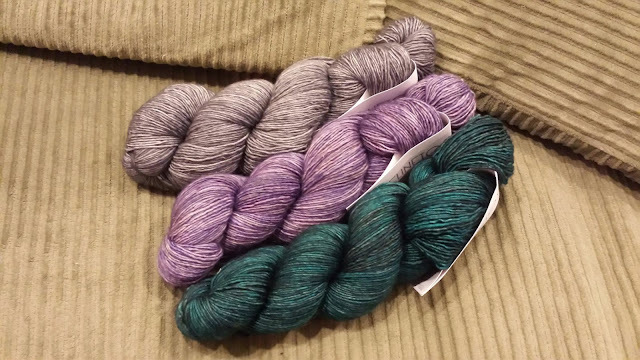 The skeins of yarn weigh 108 g (gray), 107 g (purple) and 108 g (teal) to start. I bought the colors online, so I struggled to make sure that I had colors that would work well together. I scoured projects on Ravelry to make sure the colors I was considering would work with one enough with some amount of contrast. The grey and purple are close in tone, but I think with making Grey #1, purple #2 and Teal #3 this scarf will be really dramatic. Nothing like a new project to bust out some new tools. I am going to use size 6 needles (well these aren't new) with a new 60" cable. No more using a spacer to hook two cables together, I can go straight for the long one. Wahoo! 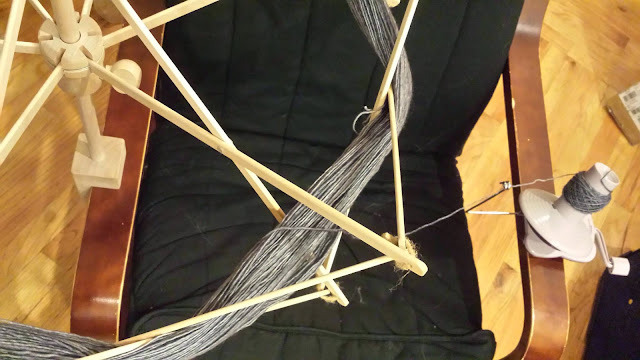 My spinning station set up - the swift and ball winder fit PERFECTLY on our chair! So I am a bit of an idiot. I am making a YO after the first stitch of each round and then dropping on the next row like I did the last time I made this shawl. In the first few rows, I accidentally knit one of hte YO's instead of dropping it to keep the edge loose. I tried to go back and fix this, but since there were increases it looked like a loose mess. I started the entire thing all over again. Thankfully I was able to get back to the same place before it was time to leave crochet club. Take 2 for the win! After the first section is complete, I have 84 g remaining of the gray yarn. Unblocked it is 6" deep at the deepest point and easily 26" wide along the "straight" edge. I think I'll try to block it with a curve in it this time. That would look pretty, right? 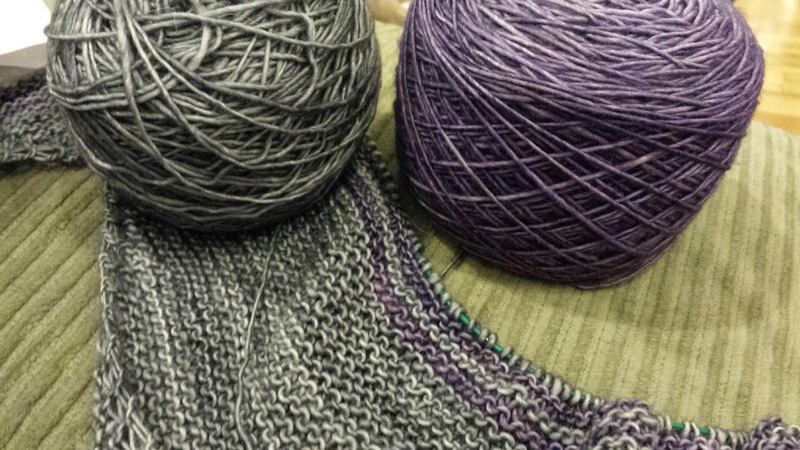 The grey and purple colors are close together, but as I've knit more rows in the two color section you can really see the stripes well. I have no regrets over my color selection. I'm hoping that this one is deeper. So far it looks like the first section is deeper than my older color affection. It is nice to have a simple project that I can work on intermittently. 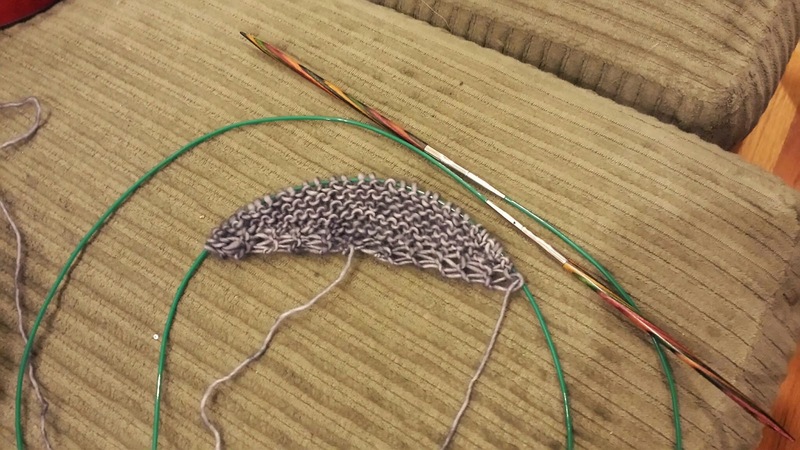 I do have to remind myself about the increases each time before I can start knitting again, but things have gone pretty smoothly. 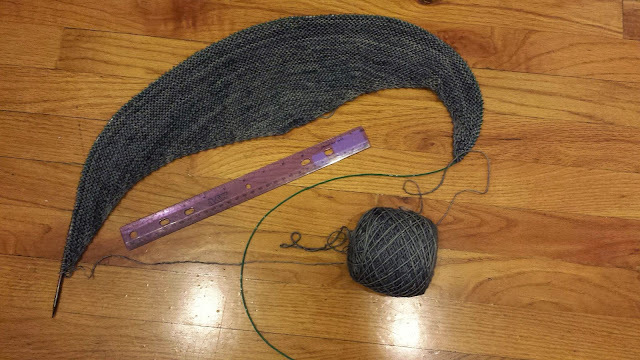 I still have a long way to go with this shawl, but I know that it will be much used once I get there. I may not finish this by the end of 2015, but I know I will keep making progress! Do you have a project that you like to take with you on the go?